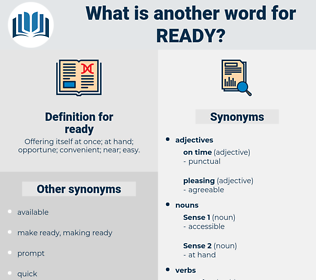 What is another word for ready? able, redo, keen, readyto, committed, finished, reluctant, speedy, prompt, determined, equipped, desperate, table-ready, immediate, interested, expeditious, likely, ready-to-use, forthcoming, finalised. Marques, markings, brands, sprouts, skills, Formulae, mulls. Drafted, received, cleared, arranged, Contributed, assembled, Wished, produced, needed, Was, paid, wanted, led, Provided, extended, packed, Gave, Got, finished. drafting, Expecting, emerging, wishing, calculating, bursting, packing, going, lining. intends, devotes, pays, Comes, works, assists, provides, submits, Permits, places, takes, creates, spends, poses, becomes, Gives, passes, attaches. ready-made, eager, well-prepared, ripe, readymade, inclined, unprepared, unwilling, amenable, ready-to-wear, ready-to-eat, mature, disposed, happy, easy, readiness, suitable, prepare, receptive, operational, Preparing. disinclined, unsuitable, bare, unavailable, uneducated, incapable, unprepared, unripe, unwilling, immature, unfurnished, unskilled. ignorant, sluggish, blunt, boring, lethargic. disinterested, unenthusiastic, sad, unhappy, stupid, apathetic. half-baked, toilsome, exacting, recondite, onerous, averse, untrained, idle, abstruse, painful, strenuous, murderous, quiescent, problematic, inactive, severe, taxing, herculean, oppressive, intricate, unamenable, stressful, inert, logy, unintelligent, hard, indolent, involved, laborious, troublesome, grueling, napping, knotty, complicated, tough, dormant, slothful, difficult, heavy, rough, labored, arduous, demanding, dull, stiff, complex, exhausting, formidable, unresponsive, quiet, lazy, Toilful, burdensome. disorganize, discourage, disarrange, disorder, prevent, dissuade, retard, destroy, displace, lose, halt, weaken, let go, disturb, slow, disallow, hold back, fail, hurt.
" Here -" " Here -" " All ready?" red tai, rid, read-out, rout, rudd, raid, 43rd, rooted, rotate, redo, riyadh, ride away, red-eye, rutty, riata, ratitae, ruth, red tide, ratty, rit., reward, redeye, rota, ride, rot, RHD, redhead, rude, red, reread, roth, raw wood, rote, rotted, rarity, rat-a-tat-tat, rete, 33rd, rat-tat, Reddy, route, ready-to-eat, ratio, ride out, rewrite, 23rd, rate, rood, redwood, reheat, rotated, riot, rout out, reit, red-hot, roadway, radio, radiate, reword, retie, Rede, rheidae, rodeo, REDI, readout, rutted, ratite, red haw, red hot, 3rd, rut, raw data, raita, rawhide, reata, rat-a-tat, ruddy, red heat, road, rad, reedy, rare earth, rod, rat, read, rite, reed, rearward, redheaded, ruta, root out, rowdy, ret, root, reid. precook, put on, whip up, devil, dress, keep, Flambe, Whomp Up, dress out, cook up, Deglaze, scallop, preserve, escallop, lard, concoct.